Welcome to the Service Bench! Virginia Scuba has a longstanding reputation for quality repairs and excellent customer service. Annual service of your life-support equipment ensures it will last a lifetime and keep you safe during each and every dive. Pre-dive travel check ups are also available! 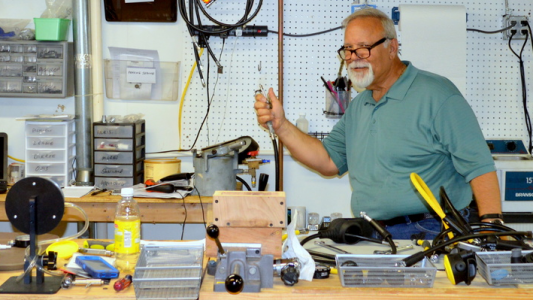 Virginia Scuba service technicians have years of experience servicing life-support equipment. All technicians are manufacturer trained and certified. Virginia Scuba staff are also trained and certified for cylinder visual inspections, oxygen cleaning & servicing. You can stop by and drop off your gear or you can ship us your gear for service from anywhere in the world. Typical turn around time on equipment service is 2-3 weeks. Rush service is available for an additional fee. Call us for details! *Service and rush fees are due at time of equipment drop off. Costs for parts (if applicable) and unforeseen costs (extra cleaning, etc) are due at time of pick up. - All equipment is pre-tested before servicing. - All equipment is serviced with original manufacturer parts. - All equipment is assembled and torqued to manufacturer specifications. - All equipment is internally and externally inspected for wear and damage. - All equipment is cleaned and made as like new as possible. - All equipment is set-up and adjusted to original specifications. - All regulator stages are broken in with modern breathing machine to set up seats. - All regulator stages are retested and final adjustments made. - All regulators are run through a full series of flow tests on a flow bench and documented. - All equipment is wet and leak tested. - All warranty paperwork submitted if under current warranty. 1st, 2nd & Octopus (Alternate) stages, and SPG/Console. Don't take that regulator on your trip without our complete 8-point inspection. Leak, pressure testing, and complete power inflator overhaul. Internal bladder cleaning included. Surcharge added in conjunction with a normal service and overhaul charges. Available only for regulators compatible with oxygen service. Includes hose cleaning as well. *Virginia Scuba's Equipment Service Program (ESP) includes preferred pricing and may include parts depending on the manufacturer. The ESP stays in effect as long as the customer maintains the warranty as recommended by the manufacturer. If you have questions please call or email repair@vascuba.com for details. Just how important is it to oxygen clean your equipment? It is so important that we have a custom designed oxygen clean room with ISO Class 5 / 0.3 micron filtration system. All oxygen cleaning for valves and regulator repairs is done inside this facility. If you purchase your tank from Virginia Scuba, the cost to make your tank dive ready is on us! Used for excessive internal rust deposits. Rust is removed, and an oxygen compatible rust inhibitor is applied to the tank. Brushing and washing to remove mineral deposits of aluminum oxide or rust. Tank valve overhaul includes replacement of the seat, washers, orings and burst disc. Washing and degreasing of both tank and valve. This is required for new and used tanks and after every VIP and hydrostatic test.